Crossing the Divide - How do we transform to a regenerative system? How do we transform to a regenerative system? Crossing the divide refers to giving up on an old system, and pressing on to create a new one, fully committed, realizing that there is no going back. The present economic system in advanced economies is market based. It assumes that most things can be objectified and priced for trading. It assumes that entities competing in their own interest will, through market mechanisms, end in optimal outcomes for all. And it presumes unending growth. Most financial and economic formulas used for guidance are growth formulas. Today, this expansionary system is trying to do something that it can’t continue much longer. Natural resources are limited. Disposal of used materials, including CO2 and other emissions from fossil fuels, are exceeding earth’s capacity to absorb them. Higher and higher consumption does not equal quality of life for all. That this is unwelcome news to governments and businesses based on this system is a gross understatement. They don’t know what to do, other than make trimmings and substitutions and keep going as before. And the system is mired in complexity. Just untangling the changes spewing out of the Brexit vote in the United Kingdom fills executives and officials with anxious quivering. They can’t imagine this lumbering albatross flying across a much wider divide. Neither can anyone else. We have to learn to think differently, very differently, and do it quickly. Prior shifts in fundamental human thinking took decades and centuries. We don’t have that long. Even if we cross the divide, have a clear direction, and dedicate full human energy in pursuit of it, untangling the mess we have made with the current system will take time. Environmental pessimists like John Michael Greer are betting that we are incapable of this transformation. After many of us die, the residue of the human race will enter a new dark age, with the chances of a new enlightenment coming along within a few hundred years being slim. So why not seek post-growth enlightenment now? What’s to lose other than our illusions? Three questions emerge from this quest: Why do it? What to do? How to muster the will to do it? First, why do it? Here’s a partial list of environmental issues in nine arbitrary categories. All interrelate, but the likelihood of any single one of them curtailing the current system is high. Taken together, each effect reinforcing others, the case for thinking very differently is overwhelming. But we seldom think this way. We examine one piece of a puzzle at a time, and ponder our next move, not where we are heading over a timeline of a hundred years and more. That’s a human problem to fix. Technically we know how to do a great deal that will dramatically reduce our abuse of nature, and we can learn much more. However, that isn’t enough. We must substantially remediate past abuse of nature. A “reverse speedometer;” slower in the red zone is less bad, but to be good reverse is necessary. The above is a double-take diagram, misleading because speed is a linear concept, but ecological balance is a systems concept. 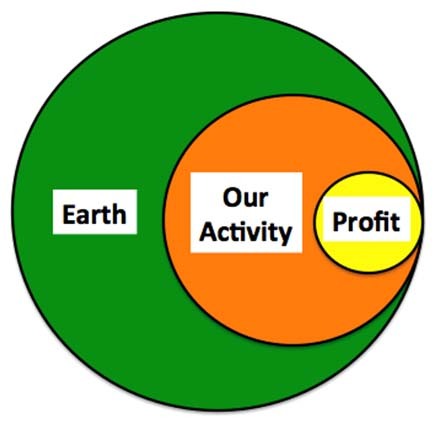 Merely slowing our growth rates of extraction and pollution doesn’t take us to a balance point in the yellow zone. It doesn’t even get us out of the red zone. 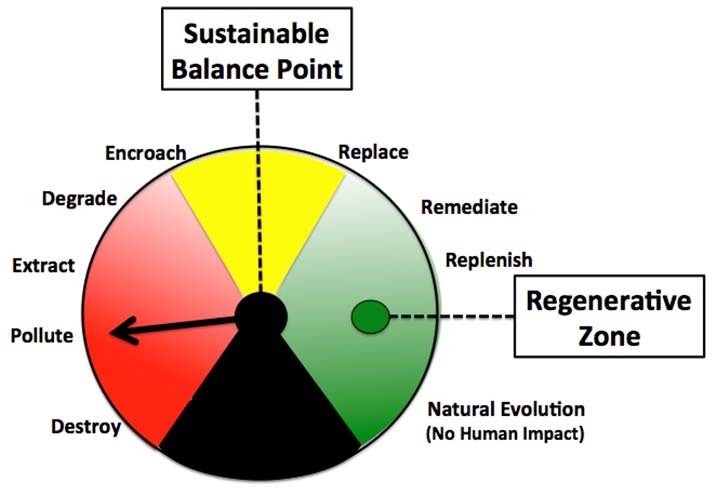 To get to a balance point in the yellow zone we need much more activity in the green zone and much less in the red. Systems thinking logic helps knife through this. For example, where electricity is used to pump water, water use and electricity use are linked: pump more water, use more electricity, and vice versa. The effects of soil remediation are more complex. Increasing humus in soil improves its capacity to grow food and other plant life, and it increases the capacity of soil as a carbon sink, which has a positive effect on climate change. If we give up more ground to expanding biodiversity, soil and forest build up, and both are big carbon sinks. But in a drought, less water in soil cuts its capacity as a carbon sink. Much of this can simplify into basic guidelines, like use less stuff and use little or no toxic stuff. The less we mess up, the less we must remediate, and remediation often takes energy. A basic guideline on action on the nine categories of environmental issues is to make a positive improvement on at least one while not making any of the rest worse. Following such basic rules is a helpful guide, but they are not magic. In practice one always has to think through the linkages in natural systems. To do this well, we need to wean ourselves from conventional economic thinking. Think of our human economy as nature sees it, rather than seeing nature as an economic thinker sees it. So how can we have quality of human life while greatly reducing resource use? Don’t think GNP per capita. Think about how to make much better use of nature close to us, whether in a “developing economy” or an advanced one. In all cases, think through what basic quality of life really requires, not more stuff per capita, but better life experience for each of us – quality over quantity, for short. A framework for this upside down thinking is sorely needed. The Compression Institute and other environmentally concerned groups need to work on it. One avenue to migrate to new thinking is through what the Compression Institute calls a Vigorous Learning Organization, which should develop a Vigorous Learning Culture. The adjective “vigorous” denotes learning from what’s around you, from evidence and from doing, as well as from vicarious education. This is the nub of the matter. Nearly all of us take up with new beliefs and motivations by learning to live differently – through practice, however haltingly we begin it. Crossing the divide is coming to accept that we have to adopt new ways of living, of working, and thinking – that our old systems do not work well any more. This thought occurs to organizations that have crossed the divide. Some use a similar three-ring symbol. But no symbol has meaning until you emotionally cross the divide, realizing is that we are but part of earth; all our activities are part of earth, symbiotic with it. As long as we must live by a transactional system, profit is a necessity, a residual from monetary accounting, but profit is not the objective. Our primary motivator is a mission that moves the needle of the “reverse speedometer” toward the balance point. We cannot transform to this new thinking separately. Of course, we can think differently as individuals, but we have to develop new systems and that requires collaboration. For example, an individual may be eager to recycle used materials, but if there is no system for recycling, one individual unassisted can only re-fashion materials as a craft project. Transformation toward a regenerating world is a collective effort. Mustering the will is a matter of maintaining confidence in each other that we will all do our part, and that we will engage in dialog and create new working relationships to make it happen. That is the role of the Vigorous Learning Organization. Imagine us in a space colony, far from earth, unable to be resupplied, and responsible for ourselves and for future generations by creating and maintaining our own life support system indefinitely. And the life support system would always be changing and never completely understood. That is really our survival challenge on earth. We live on a very big space colony that we must maintain, but can never fully understand. Bring on Vigorous Learning.